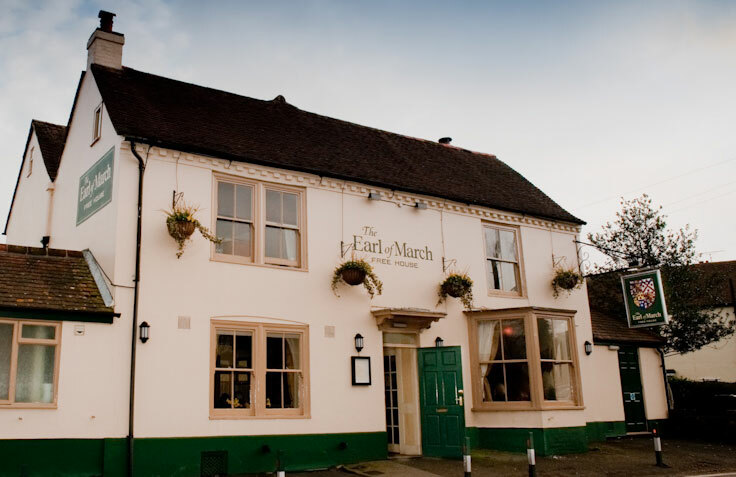 The Earl of March is a country pub restaurant set against the picturesque backdrop of Goodwood and the South Downs in the village of Lavant near Chichester, West Sussex. The pub dates back to the early 18th century and was originally named The Bat and Ball and served as a coaching inn on the main Chichester to Midhurst road. Its period stable block and kitchen still exist in structure to the rear of the pub and are waiting to be realized as trading areas as part of its function in the 21st century. Local records show that it is where William Blake the famous poet and composer wrote the words to Jerusalem in 1803, while sitting in the east facing accommodation bay window looking out over the breath taking views. It is hardly surprising that he was inspired to write such an epic anthem. The Pub more recently as The Earl of March has served as a local pub in the heart of Lavant and has been the hub of the village social life and community for hundreds of years. In early two thousand the pub ceased to trade and was consequently refurbished to its exceptional “country plush” standards and reopened in 2005 under new ownership. The pub was subsequently taken over in July 2007 by Giles Thompson the former Executive Head Chef of the Ritz Hotel London. Giles has been immersed in the food industry ever since he was born. His father was a farmer and butcher, and his mother was an excellent home cook, an environment that made him determined to become involved in some way. After spending nine years training under the brilliant Michel Bourdin at the Connaught, a true master of the techniques and traditions of haute cuisine. In 1996 he moved to Danesfield House, Buckinghamshire, as Executive Chef where he achieved two AA rosettes and an RAC restaurant award almost immediately for classical cuisine with a contemporary twist. He joined the Ritz as Executive Chef in 1997 where he combined traditional and modern styles to present dishes that fulfilled the customer’s highest expectations. Every dish, however simple, was scrumptious, made of the finest produce and perfectly presented. This was recognized by the accreditation of the Royal Warrant from The Prince of Wales, St James Palace and The Soil Association for commitment to organics; both accolades were a first in the restaurant world! In 2003 he took a change in tack after 20 years in mainstream deluxe hotels and moved to Le Cordon Bleu Culinary Academy in Marylebone as Head of School teaching students from all over the world, the disciplines of French regional and classical cookery.